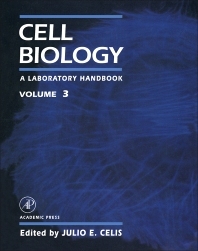 Cell Biology: A Laboratory Handbook, Volume 3 is a handbook on cell biology and covers topics ranging from transfer of macromolecules and small molecules to cloning of embryos, transgenics, and gene targeting. Cell-free extracts, permeabilized cell systems, and expression systems are also discussed, along with proteins. Comprised of 58 chapters, this volume begins with a detailed account of microinjection of RNA, DNA, and proteins into somatic cells, followed by an analysis of computer-automated capillary microinjection of macromolecules into living cells. The reader is then introduced to syringe loading as a method for inserting macromolecules into cells in suspension; electroporation of cells; and the use of liposomes in drug targeting. Subsequent chapters focus on the cloning of rabbit embryos by nuclear transplantation; gene targeting by homologous recombination in embryonic stem cells; production and isolation of recombinant viruses; and gel electrophoresis.